It is possible for one to accept the scientific benefits of cow-dung as an alternative energy source in agricultural communities. But, when one hears a self-styled cow protector proudly say, ‘‘cow’s one gram ghee [clarified butter], if we were to light it in front of God [during a prayer], it would produce 100 kilograms of oxygen in the environment’’, one not only struggles to maintain a straight face but are also perplexed by this inane scientific relationship between cows and oxygen. This is the mystically absurd yet scientific world of the Indian desi(indigenous) cow where local Vedic knowledge trumps Western modern science and one witnesses Hindutva’s (Hindu nationalism) science envy. Spearhead by the two largest Hindutva organizations, the Rashtriya Swayamsewak Sangh(RSS) and the Vishwa Hindu Parishad(VHP), the Gau Raksha,or the cow protection movement, calls for protecting cows due to their extraordinary ‘cultural, health and scientific benefits’. While cow slaughter is illegal in most parts of the country, recently, the central government released new rules for banning the sale of cattle slaughter that put the local meat and tannery industries in jeopardy. So extreme was this step that the Supreme Court stayed the ban. Such an attempt at achieving a nation-wide ban is an example of what this movement wishes to attain. 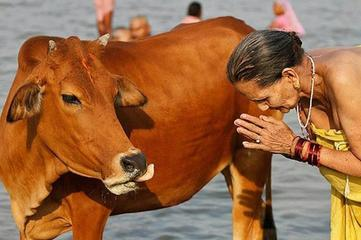 With a belief that the cow is a holy animal in Hinduism whose consumption or slaughter should be forbidden, the cow protection movement has been emboldened by Bharatiya Janata Party’s (BJP) ascent since 2014. A Hindutva political party, the BJP has used the symbol of cows to represent Hindu nationalism in the public sphere and gain traction in mainstream politics for years. Such is the power of cow politics that BJP Prime Minister Narendra Modi raised it as an issue in the 2014 Lok Sabha(Lower House) election campaign where he criticized the opposition center-left political party, Indian National Congress, for promoting‘pink revolution’– a technological revolution of the meat processing industry. If cracking down on one’s food and economic rights aren’t enough, these individuals who are sometimes lone actors and sometimes affiliated with Hindutva organizations, also wage gruesome vigilante violence against those who don’t follow this diktat (an order imposed by someone in power)thus, destroying the secular and plural fabric of India. Such vigilante violence has specifically targeted minority communities such as Muslims and Dalits (Untouchables) in large numbers. As far as the BJP is concerned, it is accused of not only turning a blind eye to a rising number of vigilante attacks but also silently encouraging such private armies for cow protection. In Maharashtra,Haryana, and Uttrakhand, the BJP state governments will soon issue official ID cards to cow protectors, thus legitimizing their politics and violence. The idea of cow protectionism emerged in the late 19thcentury in Punjab. Having founded Arya Samaj, a Hindu revivalist movement, Dayanand Saraswati promoted cow protectionism within the Punjabi society. Saraswati not only attacked Christianity and Islam for ridiculing beliefs that were irrational and superstitious, but also various Hindu traditions and beliefs that according to him were ‘anti-science’ perspectives. In his work entitled Satyartha-Prakash (The Light of Truth), he condemned Christianity and Islam, amongst other things, for their repugnant customs such as animal slaughter. Dismissing animal sacrifices in Islam and Christianity as superstitious and irrational, Saraswati proposed to bring back the ancient Vedic period that imbued social and cultural greatness due to the proliferation of scientific and technological inventions and knowledge. Saraswati heralded the superiority of Vedic scriptures against Western modern science. Accordingly, one didn’t have to emulate the West in order to seek scientific truth and knowledge; rather, all one had to do was to peer into the glorious past etched in Vedic scriptures that held all the answers. Hankering after science and rationality, Saraswati portrayed what has been the agenda of Hindu nationalists from the start—bridging Vedic worldviews with modern science. The cow then became the perfect example for Saraswati to illustrate this scientific wisdom of the past. In Gokaruanidhi (Ocean of the Mercy of the Cow), published in 1880, he framed cow protection as essential to Hindu Dharma (an individual’s duty fulfilled by observance to a custom or law), where he called upon the protection of cows not from an outright religious point of view, but rather roped in scientific reasoning and principles. On one occasion, he gives his reader detailed mathematical calculations regarding the number of cows that are needed to provide milk and cow-dung to an average-sized community as food and fertilizer. Thus, Saraswati advocates cow protectionism on rational economic and scientific grounds. Although it is doubtful that his conceived scientific knowledge was arrived at through any verification, Saraswati contributed what other Hindu revivalist leaders were only partially able to achieve: that a fellow Hindu could follow ‘modern’ science without abandoning his religious traditions and beliefs. Throughout my fieldwork in India, I conversed with middle-aged cow protectors who echo similar pseudo-scientific ideas. On one occasion, as I adjusted my spectacles, I was told to put two drops of cow’s ghee in my eyes everyday for six months and I would gain my eyesight back. Another occasion found me rubbing the back of a cow for fifteen minutes to control my blood pressure and sugar levels. Once, instead of a cup of tea, I was offered a glass of cow’ urine, as it would apparently cure my cough. I was also told that over 17 prisons in Madhya Pradesh, central India, currently have programs ‘as a reformative measure to develop compassion’and improve the mental psyche of criminals by making them take care of cows. This enterprise of Vedic science has been institutionalized in the form of Gau Vigyan Anusandhan Kendra, a centre founded in 2014 by VHP.Scientists here not only believe in curing conditions from skin diseases to cardio-vascular ailments with the help of cows, but also sell Ayurvedic medicines and cosmetic items made from cow dung and urine. The centre also boasts of a U.S. patent on using cow urine to treat cancer. Further, the centre also frequently collaborates with other government funded research centres like National Environmental and Engirneering Research Institute (NEERI), Central Institute for Medicinal and Aromatic Plants (CIMAP), and many more. While pouring enormous resources into research on cow science displays the movement’s need to glorify the ancient science of the Vedas, its collaborations with other government funded centres also illustrates unity between the movement and BJP that lends a salient legitimization of pseudo-science. Using a vocabulary of science that displays a form of technological modernization with a sprinkle of cultural re-traditionalisation, cow protectors play their part in positioning India as a scientific superpower in order to establish dignity and authority. According to Hindutva ideology, India’s dark past under Mughal rule and British colonialism were two historical periods that diminished local knowledge and pride. The narrative of cow science hence reconstructs the notion that modern science is already present in the Indian ancient past, prior to Western scientific research. Thus, Hindutva’s modern science envy is a mixture of superiority and desire to be better than the West. One of the cow protectors said to me with hope in his eyes that someday, ‘in the West, when people’s awakening will emerge [they] will understand that the cow is incomparable, without any equal’. By referring to the incompetence of the West to appreciate the Indian ancient knowledge system, which is not only spiritual but also scientific, this provides fuel for ideological constructions of an imagined Hindutva community. Ms Palak Rao is a former Early Career Researcher Fellow and was a Masters student at the Norwegian Centre for Human Rights at the University of Oslo. © Palak Rao. Views expressed on this website are individual contributors’ and do not necessarily reflect that of the Centre for Analysis of the Radical Right (CARR). We are pleased to share previously unpublished materials with the community under creative commons license 4.0 (Attribution-NoDerivatives).